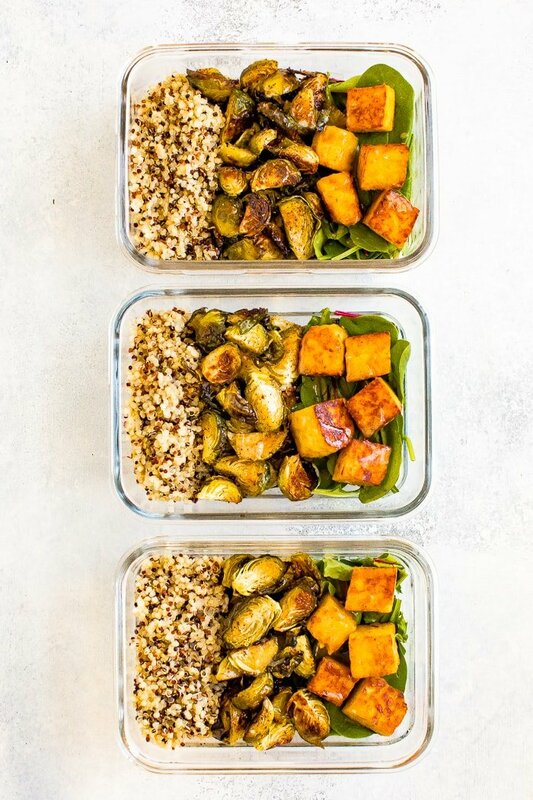 Maple mustard tempeh meal prep bowls with roasted brussels sprouts, quinoa and greens. Make this recipe on Sunday and eat well all week! This post is sponsored by Lightlife Tempeh. 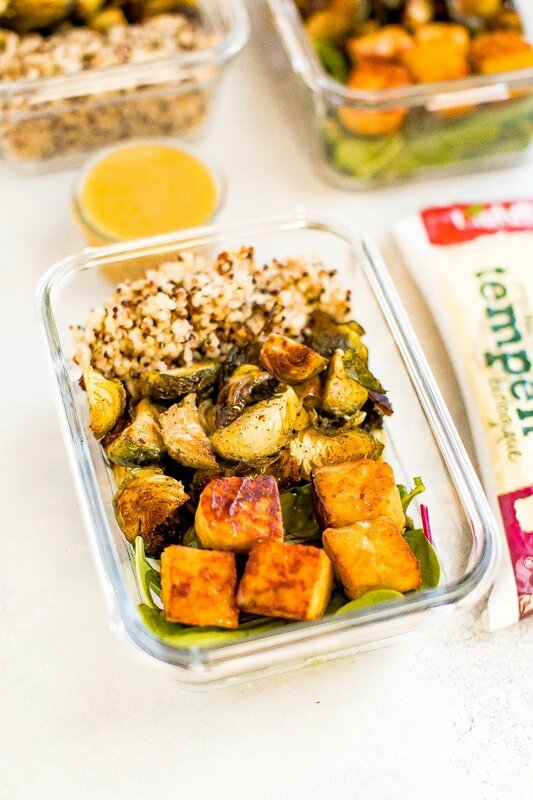 Oh boy, I’m so excited to share this new tempeh meal prep recipe with you! Do you ever come up with or find new recipes and just know they’re going to be a hit? That’s what this recipe was like. It was an instant hit in our home and I have a feeling you’re going to feel the same! As you know, I am all about meal prepping and planning. Every weekend I meal plan, grocery shop and prep for the week and I can truthfully say that it is one of the main reasons I’ve been able to maintain a healthy lifestyle and keep off the weight I lost in college. It’s a weekly ritual that I look forward to, it sets me up for the week, and is just some solid “me” time on the weekend. I’m actually in the middle of developing something really cool to share with you – details coming ASAP, promise! It’s all about meal planning and successfully reaching your health goals without dieting or restricting. I don’t want to give away too many of my tips yet, but I’ll give you a sneak peek at one: keep it simple. I think some of us have this idea of meal prep being super elaborate, complicated and has to be an all or nothing thing, but honestly, I’m most successful when I stick to a simple meal prep formula. 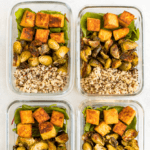 When I created this maple mustard tempeh meal prep recipe, I wanted it to be something you could make once and eat throughout the week. With tempeh, I always say that the marinade makes the dish because tempeh soaks up a ton of flavor from whatever you marinate it in. My favorite tempeh marinades have both a sweet and savory component, which pairs perfectly with tempeh’s natural nutty, earthy flavor. And the lovely part about marinating tempeh in this maple mustard dressing is that you don’t have the discard the marinade like you would with raw meat. You can save it and use it as a dressing! 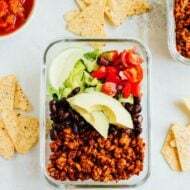 I’m using my all-time favorite Lightlife Tempeh for this recipe, my favorite brand because it’s Non-GMO Project Verified and, of course, so tasty. For this recipe, I recommend the Original or Three-Grain variety. This tempeh meal prep is legit perfect for when you have an insane week with work and nightly obligations. You don’t have to think about what you’re going to make for lunch, or if you’re having this for dinner you can simply walk in your door and this delicious meal will be ready for you to reheat. Not a huge leftover fan? You can totally make this recipe for lunch or dinner and enjoy right away. 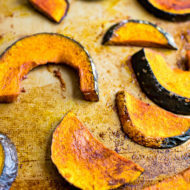 Or simply repurpose the leftovers into a new recipe! Enjoy with fried eggs or throw it all in a pan with eggs and create a “leftover hash.” Another option is to warm up the leftovers and enjoy with a base of greens and add some fun toppings like nuts, seeds or dried fruit for a delicious salad. 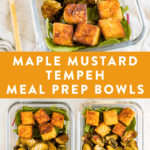 If you try this maple mustard tempeh meal prep recipe, be sure to let me know how it turns out by leaving a comment and star rating below. 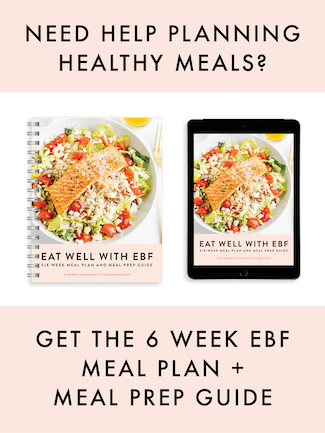 Your feedback is so helpful for me and other EBF readers! 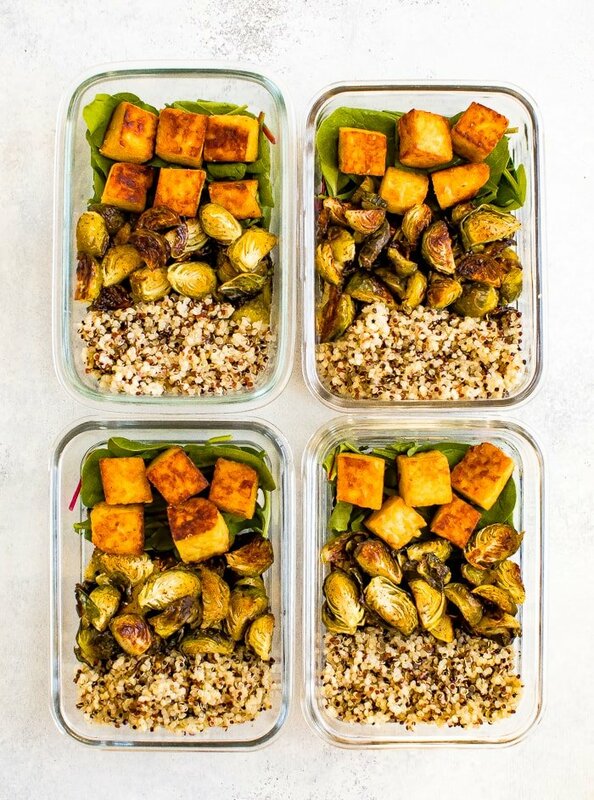 Maple mustard tempeh meal prep bowls with roasted brussels sprouts, quinoa and greens. Make this recipe on Sunday and eat well all week! Make marinade by whisking together all of the ingredients in a large bowl or container. 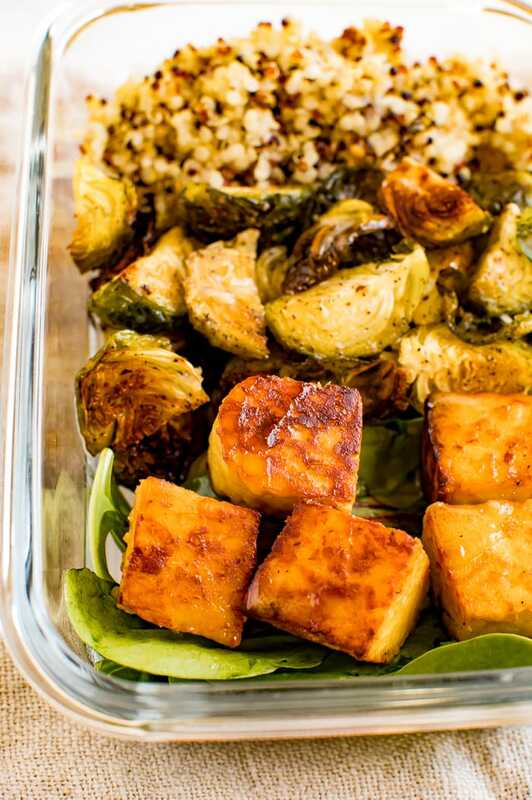 Place tempeh cubes into the bowl and place in the fridge to marinade for at least 2 hours, preferably overnight. 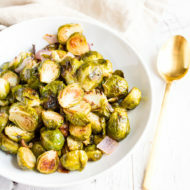 Roast brussels sprouts: Preheat oven to 400°F. 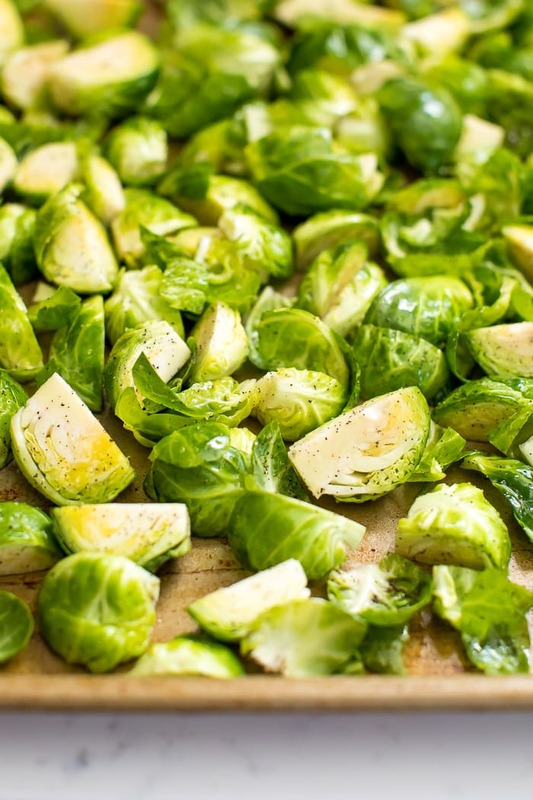 Wash, trim and chop brussels sprouts before adding them to a roasting pan with olive oil, sea salt and pepper. Toss to combine and roast for 35-40 minutes, or until cooked through with some golden brown spots. Be sure to toss around the 20-minute mark. While brussels sprouts are roasting, cook quinoa by adding 1 cup dry quinoa to 2 cups of water or broth in a saucepan. Bring liquid to a boil, reduce heat to a simmer, cover and cook for 15 minutes, or until no liquid remains. Remove from heat and use a fork to fluff the quinoa. Cook tempeh by adding 1-2 teaspoons of oil to a pan over medium heat. Use a slotted spoon to remove tempeh from the marinade and place in the pan. Cook tempeh cubes until all sides are golden brown, about 6-8 minutes. Remove from heat. At this point, you can serve the dish as is or let everything cool before dividing everything into four meal prep containers. 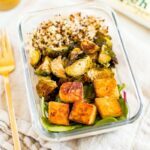 For the containers, each gets 3/4 cup of cooked quinoa, about 1 1/2 cups roasted brussels sprouts, 5 cubes of tempeh and 3/4 cup mixed greens. 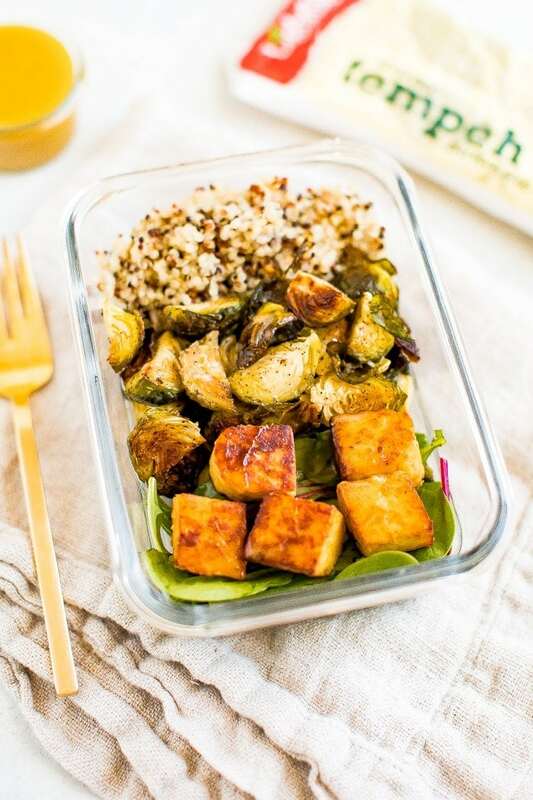 Place leftover marinade in a storage container and save to use as a dressing for the bowls when ready to serve. Looking for more ways to use tempeh? Check out all of my tempeh recipes! Delish! I didn’t have enough brussels sprouts, so I made up the difference with cauliflower. Love having leftovers, and love using the marinade as dressing. Thanks for a tasty meal! !